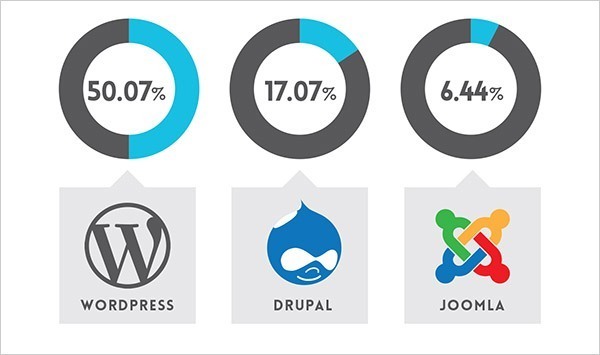 As you can see from the graph above, nearly half of the websites on the Internet are running on WordPress website platform. Just look at those recent statistics made by W3 Techs and BuiltWith. If you know how to use Microsoft Word, you already know how add your own content. WordPress can be expanded with free plugins to handle just about any site you can imagine – from gorgeous business pages to social networking sites. With “plugins” you’ll be able to add contact forms, subscription forms, image galleries and so on for your website – pretty simple, huh? #3. Small or Big site? Great for both. From basic blogs to beautiful business sites and online stores, WordPress can handle just about any kind of website. WordPress is used by eBay, Mozilla, Reuters, CNN, Google Ventures and even NASA. #4. Your site will be ‘responsive‘. Meaning it’ll work on mobiles & tablets, too. The website you build will instantly be responsive, looking great on every mobile device, smartphone and tablet. No need to hire a web developer for that..
#5. HUGE support and developer community available to help. With so many people using the platform (Webmaster, Bloggers, Theme developers and Plugin creators), it’s easy to find QUICK help when you need it. In addition, WordPress has lots of free resources both available on Youtube and their support forum. Drupal is a very powerful platform that is popular with web developers and experienced coders, but it comes with a very steep learning curve that makes it a bad choice for beginners. Joomla is similar to WordPress and works great for online stores, but you’ll need at least a little bit of technical coding to make it work the way you want. But for beginners, I suggest sticking to WordPress. I wouldn’t look no further than WordPress. 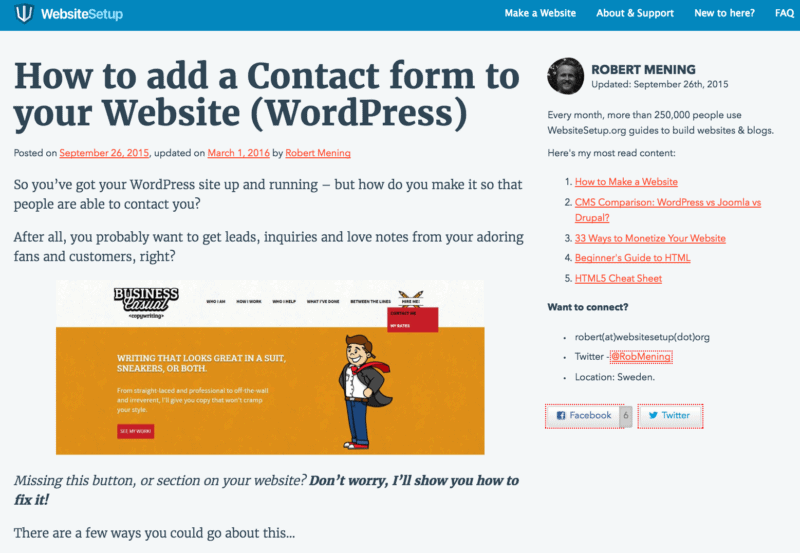 In Step 3, I’ll show you how to install and customize your WordPress website. Don’t worry – I’ll walk you through the process, with lots of images as a reference. If you have any questions/suggestions for this guide don’t hesitate to contact me. Remember; I’m here to help! The WordPress platform itself is free, but a domain name and hosting will cost you around $3 – $5 a month, but I’ll show you how to get one for free… However it costs less than a coffee, so it won’t break the bank. I’ve mostly used www.Bluehost.com as a web hosting and domain registrar for myself and for my web development projects. Their website hosting costs lest than a movie ticket ($3.49/mo) and they throw in a FREE domain name (a nice perk to have). Of course you can try other web hosting providers and even try to host your site by yourself, but it’s very complicated process and often wouldn’t be capable of serving your website visitors. So save yourself some money to get a proper web host. What kind of domain name should I pick? While .com, .org and .net are commonly used and easily remembered, the domain extension craze hasn’t really gone mainstream yet – so people may not find you if you use a really different domain extension. Any additional tips for choosing my domain name? #1 Is it brandable? For example, if you make a site about poetry then best-poetry-website.net is not a good choice: poetryacademy.com or poetryfall.com is much better. #2 Is it memorable? Short, punchy and clear domain names are much easier to remember. If your domain name is too fuzzy, too long or spelled in a strange way, visitors may forget it. #3 Is it catchy? You want a domain name that rolls off the tongue, describes what you (or your business) does and sticks to the head. Coming up with a cool name can be a bit tough since there are approximately 150 million active domain names in the world right now – but don’t give up. Secure your domain name and web hosting. For this I recommendBluehost.com, but you can pick any other web host as long it’s reliable and simple. 2. Go to your control panel. 3. Look for the “WordPress” icon. 4. Choose the domain where you want to install your website. 5. 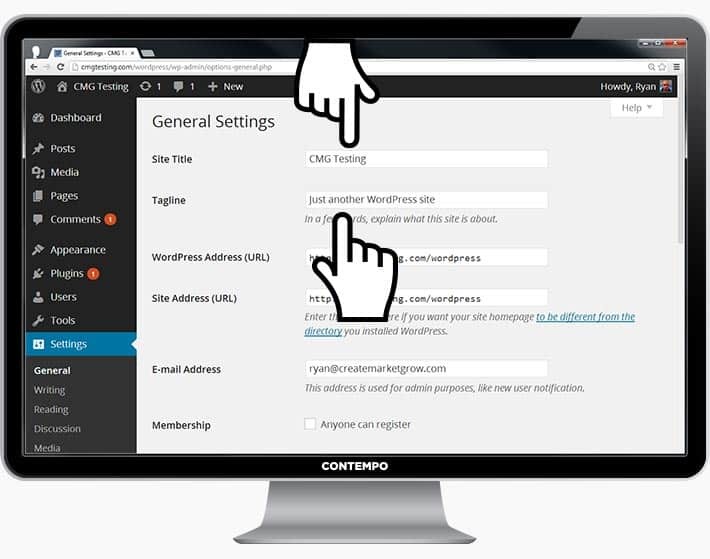 Click the “Install Now” button and you should get access to your NEW WordPress website. 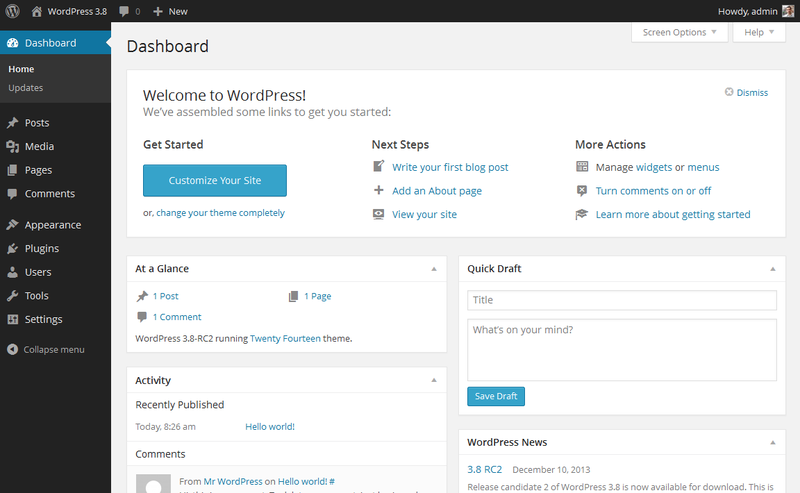 If you you’re unable to locate it, look here: How to Install WordPress on Bluehost. Installing WordPress Manually (Click to expand)Pssst – if they don’t have 1-click-installation, maybe you’re dealing with a bad host! If you’re not sure how, type in: http://yoursite.com/wp-admin (replace “yoursite” with your domain). b. 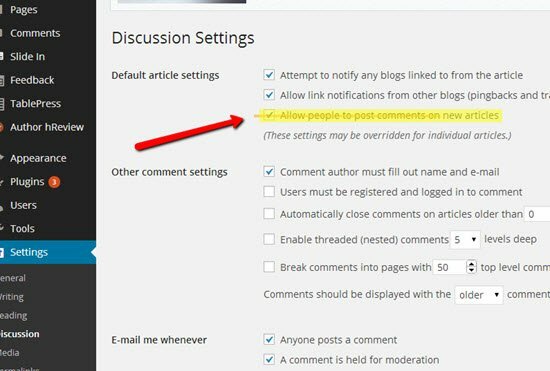 Create a blog post by going to “Posts -> Add New”. 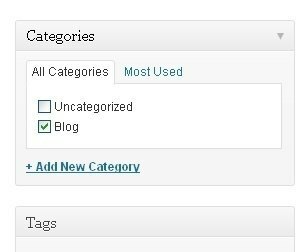 Once you’ve finished writing your blog post blog post is ready, you need to add the right category for it. 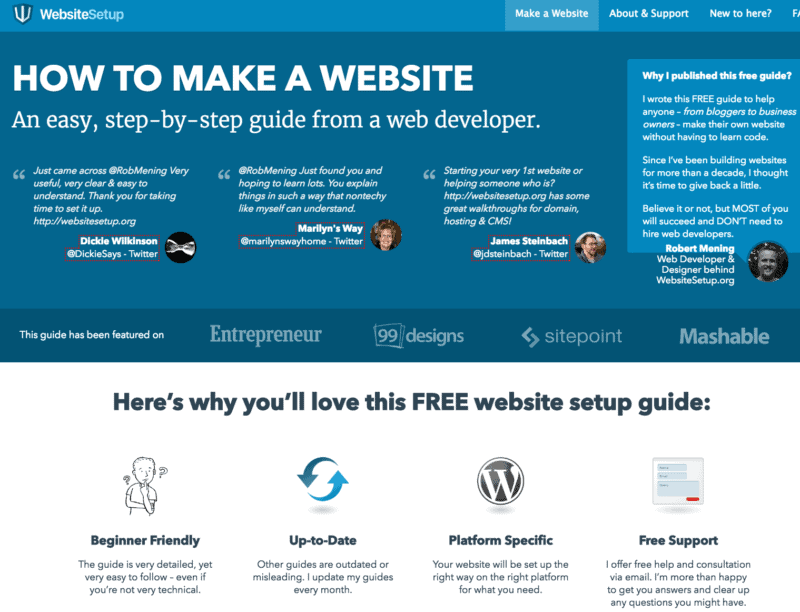 In this section I’ll cover some of the basics things I’m asked about all the time that will help you to tweak your website. 2. From here, you can use drag n’ drop to add different “boxes” to your sidebar, or remove the items you don’t want. BUT – before you go and install every single one, I suggest you to read this article: Things you need to know about using WP plugins. Of course, this is just the tip of the iceberg! Here’s a list of the top 100 plugins for WordPress by Tom Ewer, someone who knows more about WordPress plugins than me… and that is basically it.